Local food writer Dotty Griffith dishes the goods. In The Ultimate Tortilla Press Cookbook, out since January from Harvard Common Press, former Dallas Morning News dining critic Dotty Griffith, who now teaches food journalism at the University of North Texas, has penned a guide to bringing the art of the hand-pressed tortilla into the home kitchen. Griffith’s previous cookbooks include The Contemporary Cowboy Cookbook and other tomes dedicated to celebrating the food of Texas in all its regionalism. 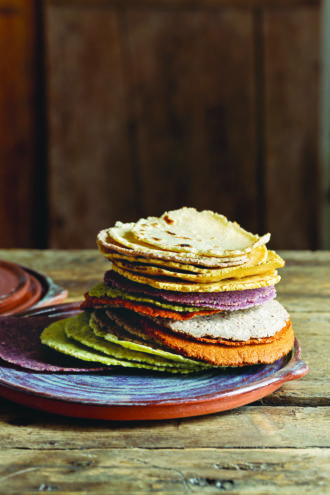 The cover of her latest book shows a beautiful array of the warm, soft, pliant rounds you can fashion, from rust-colored pasilla chile or cilantro-lime corn tortillas, sundried tomato or Sriracha flour tortillas, and deep purple-blue corn or gluten-free brown rice and quinoa tortillas. After the cutely named “Meet the Press” section, you’ll find recipes for former fillings and extras, including proteins, red and green rice, avocado crema, salsas, and—in an insider coup—the recipe for the queso served at the Old East Dallas Tex-Mex staple, Ebar. The book is interspersed with facts, history, and tips from experts such as Lesley Tellez, author of Mexican Street Food. Photography by Kristin Teig is appetizing and vibrant, making you want to dive into the chapter of more complex masa applications, like Mexican street sopes, puffy tacos, and gorditas.